The early results are promising for local high school baseball squads in the spring campaign. Waterloo is off to a 5-1 start thanks largely in part to an offense that is averaging 9.4 runs per game. On Monday, the Bulldogs defeated Freeburg 11-6. Marcus Heusohn, Sam Kreinberg, Ty Kueper and Josh Wittenauer collected two hits each in the win. Last Wednesday, Waterloo won 4-0 over Althoff. Drake Downing allowed just one hit over six innings and struck out nine to lead the ‘Dogs. Brad Hausmann pitched a scoreless seventh. Wittenauer, Ty Kueper and Nate Albrecht collected two hits each to lead Waterloo’s offense. Last Tuesday, Waterloo lost 7-1 to a tough CBC squad from St. Louis. Ty Kueper collected an RBI double in the loss. The Bulldogs play at Valmeyer on Wednesday against Cahokia and Gibault at SPPS Field on Saturday and battle Mississippi Valley Conference foe Mascoutah on the road Monday. Ty Kueper is hitting .467 and twin brother Trey Kueper is hitting .438 in the early going for the ‘Dogs. Tommy Carr is hitting .429. Heusohn is also swinging a hot bat, going 6-for-10 with a home run to start the season. Gibault (8-1) dropped its first game of the season Monday at Marquette, falling 3-1. Mark Branz went 3-for-3 with a double and Tim Reinholz struck out seven and allowed just one earned run over four innings. On Thursday, Gibault won 10-0 at Red Bud. Branz went 2-for-4 with two RBIs and Reinholz went 2-for-3 with two RBIs. Nick Weilbacher struck out seven and allowed just two hits over five innings. Last Tuesday, the Hawks won 18-13 over Chester. Austin Sweeney went 2-for-3 with three RBIs and Cam Kincheloe went 2-for-4 with a pair of doubles and two RBIs. Gibault battles cross-county rival Columbia at GCS Ballpark in Sauget this Friday night before hosting Cahokia and Waterloo on Saturday. Branz is hitting .563 with 10 doubles, 15 RBIs, 13 runs and 10 stolen bases so far this spring. Cole Buckner is hitting .455 with 11 RBIs. Ian Metcalf (8-for-16) and Tate Schilling (9-for-19) have also provided an offensive lift for Gibault. Columbia (8-2) lost Friday at Edwardsville, 8-4. AJ Mueller went 3-for-4 with three RBIs and Jonah James added three hits for the Eagles. On Thursday, Columbia won 14-4 over Freeburg. Josh Marion and Adam Wibbenmeyer led an 18-hit attack with three hits apiece. Mueller added a homer and two RBIs. 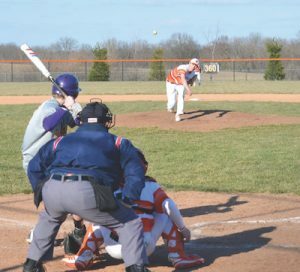 Last Tuesday, the Eagles pulled off an extra-inning win over Wesclin, 4-3. Nic Horner’s walkoff hit in the eighth won it for Columbia, scoring twin brother Sam Horner. Both had three hits in the game. Following Friday’s game at GCS, the Eagles play at Red Bud on Monday. Mueller is hitting .410 with three homers and 19 RBIs this spring. Sam Horner is hitting .485 with 14 runs and Nic Horner is hitting .417. Marion is hitting .444 with 13 runs and James is hitting .433 with 11 RBIs. Logan Denison is 2-0 with a 2.92 ERA in 12 innings pitched for the Eagles. Valmeyer (6-5) won 10-2 at Dupo on Thursday. Henry Weber went 2-for-3 with three RBIs and Gibson Sippel and Sam Fitzwilliam collected two hits apiece. Last Tuesday, the Pirates dropped a 3-2 contest at New Athens. The Jackets plated a run in the bottom of the sixth inning and held on to win. Jacob Rowold and Logan Seidler each had two hits in the loss. 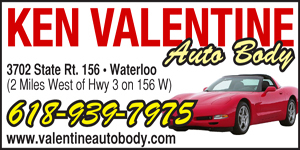 Following Wednesday’s home game against Waterloo, Valmeyer hosts Marissa on Thursday and Althoff and Valle Catholic on Saturday. Riley McCarthy leads Valmeyer in hitting at .471 with 17 RBIs. Philip Reinhardt is 2-0 with a 1.24 ERA and 28 strikeouts on the mound. Dupo (2-5) was led by Devin Similey in the loss to Valmeyer. He had three hits and currently leads the team in hitting at .478. Tyler Kyle is hitting .455 for the Tigers, who play at Chester on Wednesday and host Red Bud on Thursday.